The case materials were not submitted to the court. Kyiv Appeals Court postponed until January 3, 2018 consideration of the appeal for the refusal to put under house arrest the former president of Georgia, leader of the political party The Movement of New Forces, Mikheil Saakashvili. The presiding judge said the postponement was the case file was not delivered to the court and the meeting will be held at 11:00 on 3 January. Earlier, the court postponed the appeal against the arrest of Saakashvili's ally Severin Dangadze because the first instance – the Pechersk district court – failed to give the case materials over to the appeal. On 10 December, Kyiv's Pechersk district court refused to put Saakashvili under round-the-clock home arrest and released him from police custody. 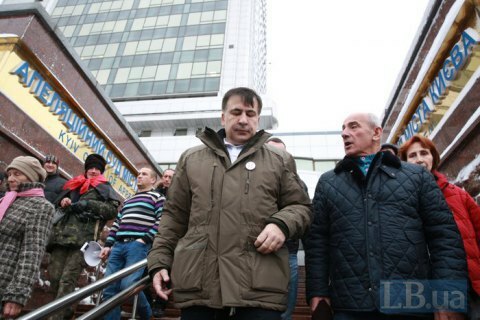 Saakashvili's supporters on Sundays hold mass anti-government rallies since 17 December. A Kyiv march on December 10 gathered about 10 thousand protesters. During the next march on 17 December, ended in clashes with the police and the National Guard and the attempted storming of the October Palace concert hall, where Saakashvili planned to use as his movement's headquarters. Later, Saakashvili announced putting mass protests on hold for the New Year's and Christmas holidays.